This morning I give praises to my mom. She's been braggin' about the book and sending me all of the responses. Major affirmations this morning. But when I sent her to aheartt.com (the author's site), she found something new, something I didn't know existed, and something I'm very excited to share!! 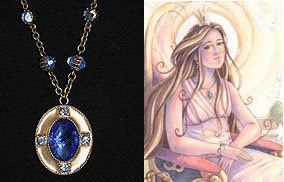 In the book Princess Sophia's Gifts , Princess Sophia receives a sapphire necklace from the wise woman Athena. This is a replica of this necklace. It's only $10! Proceeds from the sale of this necklace will fund books and donations to youth experiencing similar losses and disability.